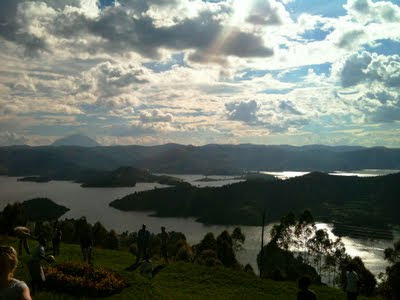 The view from Acadia Cottages looking over Lake Bunyoni and into eternity. The shifting images in front of my eyes have been so varied today. We have gone from the busy city of Kigali, wound our way through the Rwandese hills and valleys, negotiated the border crossing, arrived in Kabale for long enough to unload our bags from the Coaster and now, with my small troupe of students, have headed up into the hills. It is still Sunday 10th April and I am high up above Lake Bunyonyi, a few kilometres outside of Kabale, in southwestern Uganda. With me are a couple of teachers from Kigezi High School, twelve of their students, one of my colleagues from the UK and my twelve students. We are here to get to know one another a little better. The truth is that I know Penninah and Patrick from Kigezi very well now - this is my third visit to this district after all. The two groups of students instantly take an interest in each other. It is only a matter of time before the ice is broken with conversations about football, music, life, technology. My group of students is quite simply the most proactive, polite and friendly group that I have ever worked with. They've cast off the cocoon of Western cotton wool already and with no prompting from myself. Whilst the students organise themselves and take part in some games involving a rugby ball and football that I bought in London, I take time to look out across the lake. I've been on the lake before, but never up high looking over it like this. The scene of the fading afternoon sun shimmering over the fingers of the lake and peaks of islands and hills seems to run on into eternity. It could be the roof of the world for all I know. As the name-learning games continue, I think to myself how beautiful this country is. I also think to myself how busy this week is going to be. Never having led an international trip before, I can't help but find it all a tad daunting, but with students as well behaved as this and a great team of adults too, it is going to be easy. It is already going so well.